My mom had given me a whole bunch of her empty Crystal Light containers for Michael to put his crayons and markers in. I had three unused containers and decided to use them for our boxes. 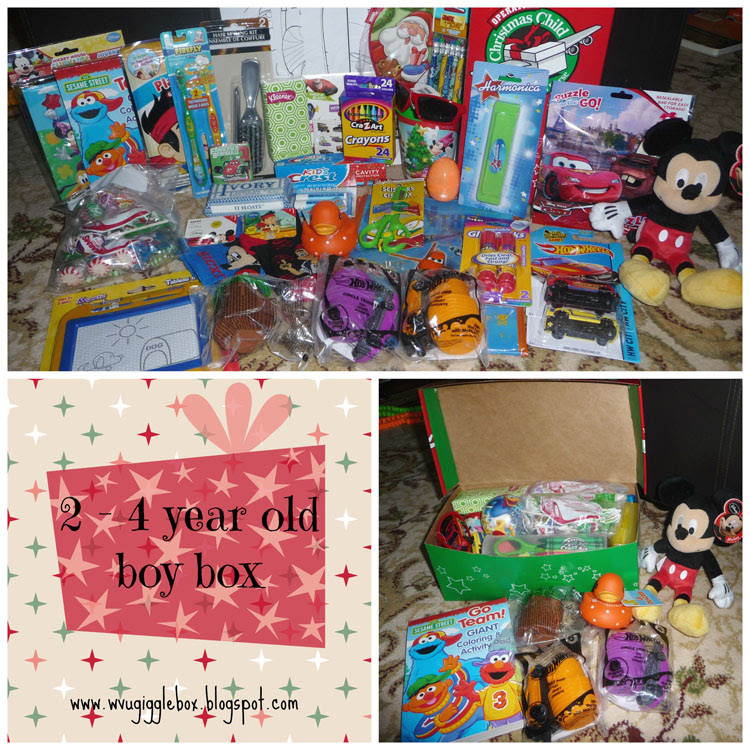 This is the one for Michael's box. 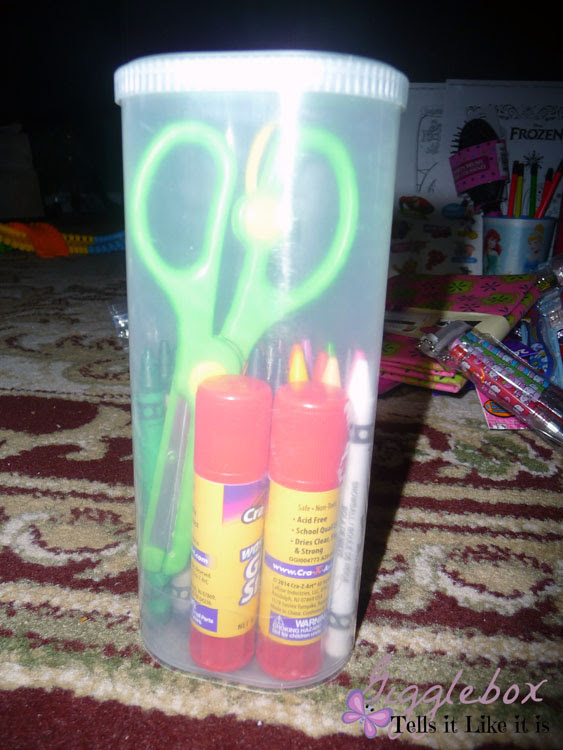 The whole box of crayons, safety scissors, 2 glue sticks, and I had bought some erasers and pencil grippers after some of these pictures were taken fit in this container. My mom will be adding a pencil sharpener to the boxes for me. I also used the cup to help hold items and get more in the box. 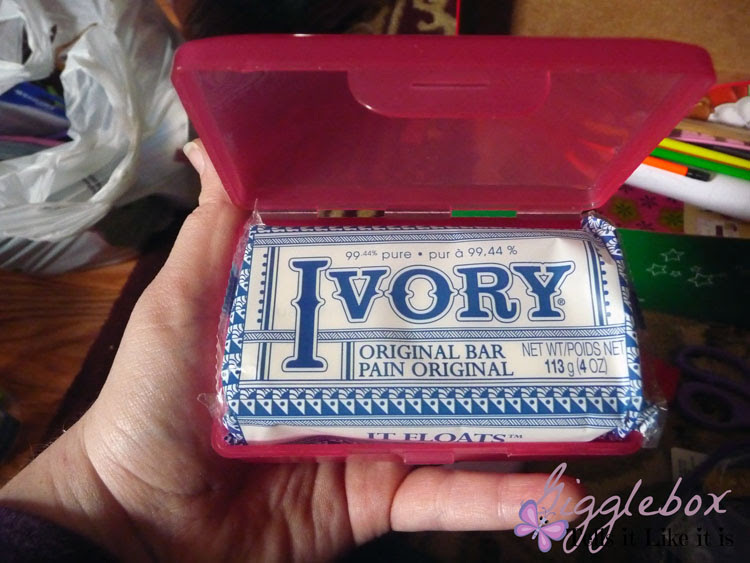 I also bought soap holders so that their soap could be stored after they opened them up. 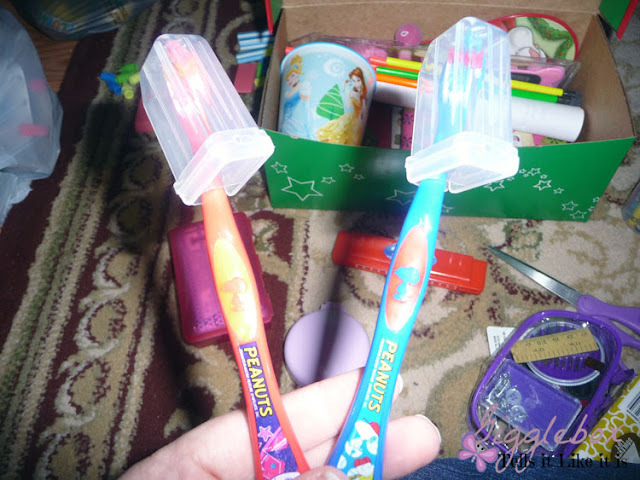 Tooth brush protectors for all the tooth brushes. I love the one that I use for my tooth brush. Michael had a lot to do with the candy that will be in all the boxes. We always put peppermint and spearmint mints in our boxes. 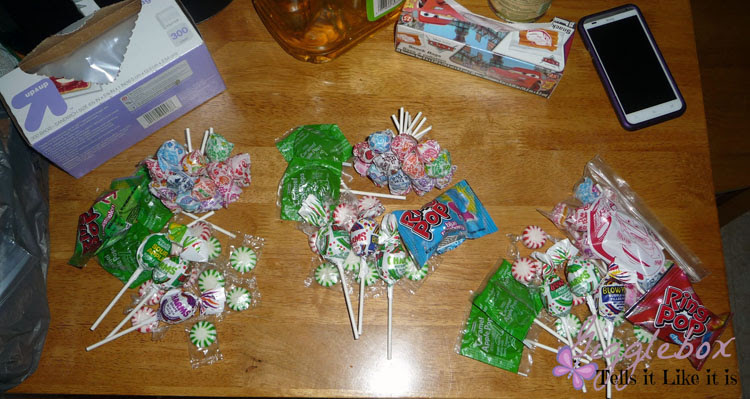 We bought a bag of Charms blow pops with the bubble gum inside and I divided them up amongst the three boxes. The same for the caramel cover apple suckers which are Michael's favorite suckers right now. The bag with the ring pops had four so I added the forth one to Michael's huge pile of Halloween candy. We bought all the candy except for the dum-dums at the Dollar Store. 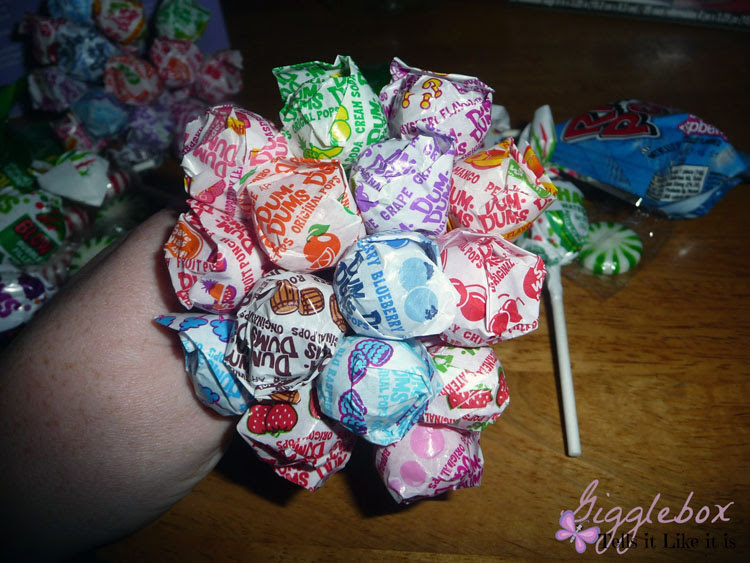 When I was a bank teller, I would make dum-dum bouquets like this one for the kids when I had some down time. My original plan was to put one in Michael's box, but it took up too much room. I ended up putting it in a Cars snack baggy like the pile of candy on the right. We already had a huge bag of dum-dums so I just picked out every flavor for each of the three boxes. Don't forget to double bag all your candy. Yep, these kids are going to probably be on a sugar high for a few days! What special treats and items do you put in your boxes? Since this was Michael's box, we try to make it reflect his likes. I also printed out special coloring pages that I filled out for Michael to put in his box. This year I asked Michael the questions and he told me the answers. In a few years, he'll be filling them out himself. 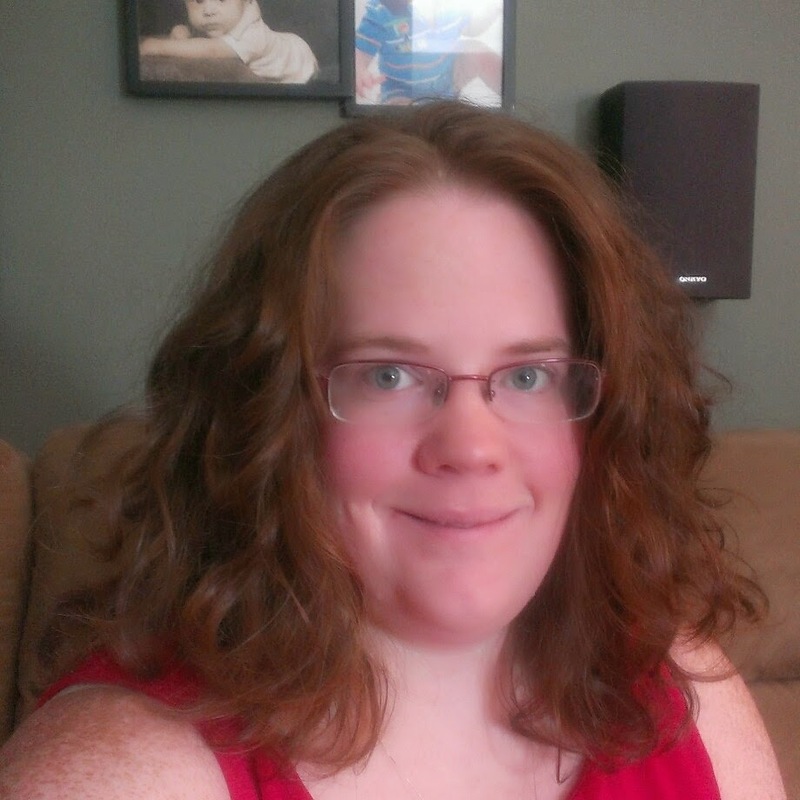 I also plan to print out a family picture to place in the box so the little boy can see what we look like. I love doing these boxes and try not to go over board, but I can't seem to help myself. I love giving gifts! I'm sure there's so much more you can get, the boxes just aren't big enough.